Last edited by Purgator; 1st Dec 2018 at 09:31. May the Builder bless you all. Don't forget, in 2020 which is 2 years from now will be Thief II: The Metal Age's 20th Tafferversary as well. 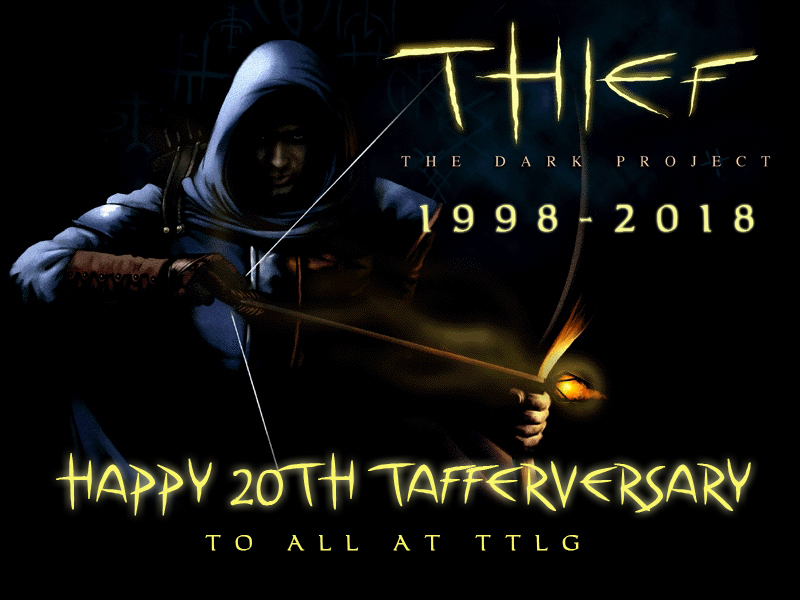 Until then, happy 20 years to the original Thief game that started it all! 20 taffing years already. tsk. Just took a celebratory sneak through Bafford's for the first time in I guess nearly 10 years: Expert. Nerves totally wrecked. Got the scepter. Plus nine hundred and something gold before I get spotted in the roof garden - fast exit leaping into the pool below and escaping out into the streets. It's still great. Happy 20th! This game has given us a lot of fun over the years and is still going. Old thieves and legends never die. They just steal away into the night... Or the sunset ? All the best, taffers and tafettes. A seemingly underdog game that vastly enriched the medium and that we're still fond of 20 years later. Thief, warts and all, is a legend in the best sense of the word. Happy Birthday Thief. For a good stretch of time, Doom was my all-time favorite game, but then Thief came around and completely changed my tastes and opinions on gaming. Not long after, I ran into this awesome community, which perfectly compliments the greatest game every created. Long live Thief - let's keep the torch burning. Happy birthday to The Dark Project. Longtime member but this is my first post here (at least I think so). Felt like a good time to say hello! I was a wee child when TDP came out, no more than 6 years old, so I didn't play it until a few years later. The Dark Project was the first game that I played and nowadays basically the only game I play along with The Metal Age and occasionally Deadly Shadows. These 3 (without a doubt the first 2, at least) still holds up better than most modern games, I think, and are among the top places of the best games ever made. I have a feeling that the original games will continue to go strong as absolute classics for many more years. And that is thanks to you all, of course! I was half expecting a "happy birthday Thief" thread that exactly followed the format for FM makers' birthdays. I've only just noticed this today, but this forum is absolutely buzzing right now. I saw at a glance that the highest traffic ever was just 7 days ago and, as I type this, there's somewhere around 400 people online (most of them not registered but whatever). Crazy times. It's hard for me to express how much I love Thief and how much it influenced my tastes. Happy Birthday, Thief! I've been playing games since the early 80s, and Thief, in the form of its FMs and the awesome community here, is the only game I come back and play every single year. And despite all the new games I've enjoyed and continue to discover and enjoy, playing Thief always feels like coming home. Happy Birthday to still my all-time favorite game! ^pc gaming since 1873 what the hell is up with that? It's a joke about the review of "Difference Calculations" in 1873.